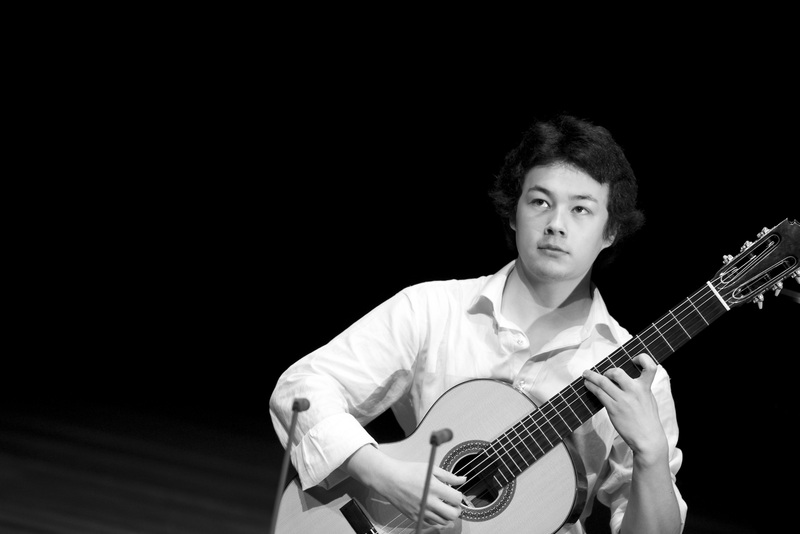 Sean Shibe was born in Edinburgh in 1992, and is currently studying guitar at the Royal Scottish Academy of Music and Drama, under Allan Neave. His musical education was grounded in the Scottish National Centres of Excellence from the age of 9, firstly in the City of Edinburgh Music School. Shortly after turning 14 he moved to the Aberdeen City Music School to commence study under Allan Neave. When 15 years old he auditioned for music conservatoires, receiving scholarship offers from the RSAMD, Trinity College, and the Royal College of Music in London. He received his ABRSM Diploma (perf.) with distinction in the Summer before assuming his place in the RSAMD, as the youngest musician to ever enter the establishment. Upon graduating he received honours of the first class. He has worked with such groups as the Barbirolli Quartet, the Scottish Flute Trio and Scottish Opera, and is in regular demand as a soloist from guitar festivals around the United Kingdom, having performed at Dundee Guitar Festival, Big Guitar Weekend and Ullapool Guitar Festival. In 2009, he was invited by West Dean International Classical Guitar Festival to perform the first movement of the Brouwer Sonata to the maestro himself. In addition to these invitations, he has performed recitals and as a concerto soloist to critical acclaim in the United Kingdom, China, Holland, Germany, Liechtenstein and has featured on the BBC and European television and radio. He regularly collaborates with composers in reworkings and new compositions to consistent critical acclaim, so far having premiered seven new works. These include a reworking of Jacob’s Ladder by Halfidi Hallgrimsson (Icelandic Symphony Orchestra composer-in-residence) in his first recital series in the 2008 Edinburgh Festival Fringe. In the annual PLUG new music festival of 2009, his premiere of Marek Pascienczny’s Sequenza for guitar solo was reviewed as: “pure magic…the best acoustic guitarist I have ever heard…Sean Shibe…remember the name, one day he will be famous” (Michael Tumelty, The Herald). He also competes on an international level – in 2008, aged 16, he was a finalist in the first senior competition he entered, “Westfalian Guitar Spring” in Germany, and later that year received the Chanterelle Guitar Prize. The following year he won the Royal Over-Seas League Len Lickorish Award for a String Player of Promise, was awarded second place in the LiGiTa Liechtenstein International Guitar Competition and Festival, and first prize in the Ivor Mairants Guitar Award of the Worshipful Company of Musicians. In November 2010 he won the North East Scotland Classical Guitar Society Award, and 3 months later, in London, won the String Section Final of the Royal Over-Seas League Music Competition. In May 2011 he was awarded 3rd prize in the Anna Amalia Guitar competition in Weimar and 2 weeks later became only the second guitarist ever to win the Royal Over-Seas League first prize and gold medal. In February 2012, following nomination and shortlisting, he became the only solo guitarist to have received a Borletti-Buitoni Fellowship. Highlights of this season have included a Wigmore Hall debut and sell-out performances at the East Neuk and Brighton Festivals. Later this year he will make his debut with the BBC Scottish Symphony Orchestra, performing Rodrigo’s Concierto De Aranjuez under Andrew Manze. I first met Sean when he joined NYGE in 2005. He was around 4’8”when we first met. He is now an artist of growing stature. If you can receive BBC playback, this is a great link to listen to his work as a BBC new generation artist.Here is a link to an interview in the Scotsman. El Sistema has taken root in Scotland, and there is new funding for a project In Aberdeen. Scotland looks set to get its third El Sistema-style children’s orchestra project, thanks to backing from Aberdeen City Council. Big Noise Torry, based in the Torry area of the city, will be a partnership between the local authority and charity Sistema Scotland, and according to the council could be up and running as early as 2015. See link in Classical Music Magazine.